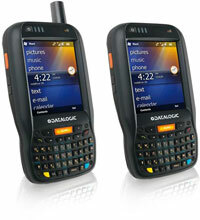 The Datalogic Elf packs unprecedented features into a compact form factor built for single handed use. Use of an accelerometer eliminates awkward presentation of on screen data and a unique guitar pick stylus provides for intuitive touch screen navigation. Getting a job done quickly has never been easier with a 624 MHz processor and 256 MB RAM. The Elf has a Micro SD card slot supporting SDHC storage cards provides for virtually unlimited storage space for photos taken with the onboard 3MP camera. The Elf features both a 1D laser scanner and 2D barcode imager enable a wide array of barcodes seen across diverse enterprises. 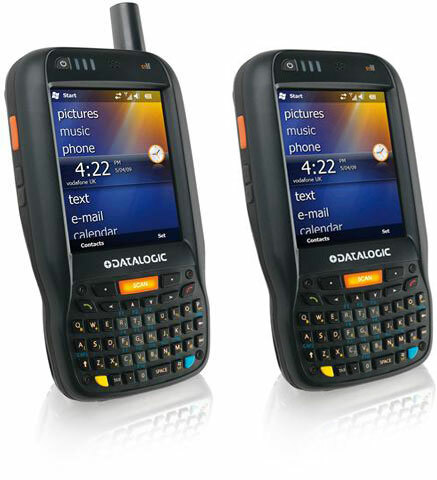 Both have Datalogic's patented Green Spot good read technology to improve user efficiency and accuracy HF RFID readers available in combination with barcode readers complete the package. The Elf PDA provides four wireless technologies in the same form factor: Bluetooth EDR for fast data transfer, 802.11a/b/g with Cisco Certified security, UMTS HSDPA for real-time communication outside the enterprise and GPS for location based applications and directions. Wi-Fi (802.11a/b/g), Bluetooth 2.0, Standard Laser Scanner with Green Spot Technology, Windows CE 6.0, 256MB RAM/256MB Flash, 46 key QWERTY Keypad. Interface cables and charging cradle sold separately. Wi-Fi (802.11a/b/g), 1D Laser Scanner with Green Spot, Windows Mobile 6.5, 256MB/256MB, Bluetooth, 46 key QWERTY Keypad. Interface cables and charging cradle sold separately. Wi-Fi (802.11a/b/g), 3.5G UMTS HSDPA, Bluetooth, 1D Laser, Green Spot, Windows Mobile 6.5, 46 key QWERTY.